Perhaps you just got fired, divorced, lost a loved one or conquered cancer. Maybe you’re between high school and college and want to start your gap year with a journey that will set your life’s course. For those of you hitting 40 or 50 it’s midlife crisis time and you’re wondering if there is more to this life. You sense that inner greatness lurks beneath the scar tissue built by relentlessly chasing the greenback and you want to reach for it. We all need a shot of adrenalin at some point in our lives and we suggest that shot is time spent in primal nature on an adventure travel journey. Many folks are instinctively drawn to such an adventure, but fear holds us back. The Walter Mitty in us fantasizes about conquering peaks and exploring places we only see in coffee table books or on the big screen. We also know the clock is ticking and if we are ever going to shed the Mitty mentality we need to go for it now. At the end of your days you’re not going to remember when the boss promoted you, but you will cherish the moment you conquered Kilimanjaro. Kilimanjaro stands at 19,341 feet, the tallest mountain in Africa. You’ve never climbed a fourteener in Colorado or even been to the highest point in New Jersey (1,803 feet) your home state so how can you summit Africa’s iconic beacon? It’s 95 percent mental; the other half is physical. That may be an exaggeration, but adventure travel is as much a state of mind as anything else and once you’ve set the goal you work strategically to achieve it. It’s a discipline and you need to shake off the outside naysayers and internal inertia that have prevented you from tapping that deep reservoir where your inner greatness flows. You will never tap that greatness spending hours in front of a computer or on your cellphone or watching others do it. There is nothing virtual about climbing Kilimanjaro, this is as real as it gets, but you don’t do it alone. Pick an outstanding adventure travel company like Tusker Trail and you make it happen alongside Tusker’s top tier guides who monitor your health on the ten day climb. This is not a solitary quest, you will have a lot of help from your guides and your fellow hikers who can provide some of the mental and physical inspiration to get you to the roof of Africa. Climbing Kilimanjaro is not easy and that’s the point. If it were easy it wouldn’t challenge you to get in the best physical and mental condition you have ever been in. The challenge and reward are intertwined. You adopt a warrior/athlete/explorer persona and in that transformation you step out of your Walter Mitty vicariousness and become someone who has been somewhere and has done something special. It can change your life forever and that is the reward. But you have to start with the assumption that you can do it. It may seem audaciously impossible but it’s not. 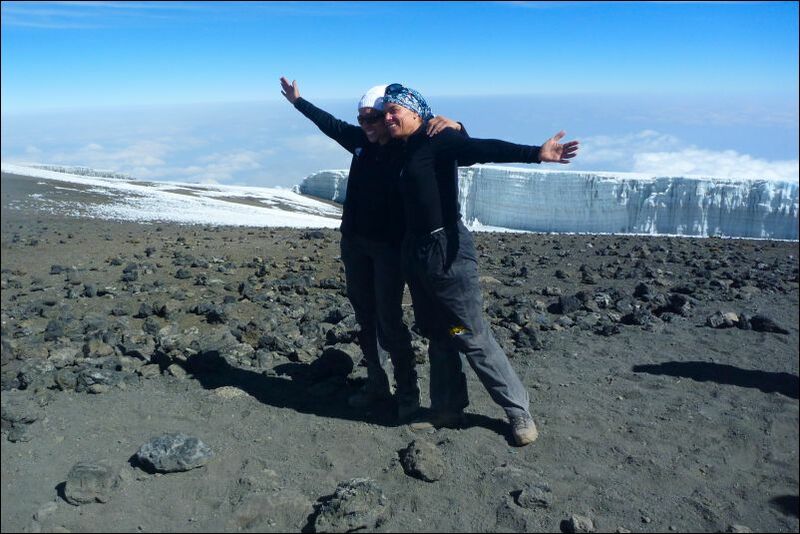 Tusker has hosted many first time adventure travelers some who have major physical challenges and make it to the Kibo summit. After achieving Kilimanjaro they went traveling with us to Mongolia, Patagonia, Nepal, Bhutan, Peru and Iceland since. Something clicked—they conquered their fear—and discovered themselves and the bigger world outside the U.S. and themselves. In some ways picking Kilimanjaro for your first overseas adventure travel experience is a slam dunk. The mountain is a well-established destination and over 40,000 attempt to climb it annually. The routes are set, you’re not going to get lost and safety is less of an issue. You can even use your cellphone if you must. The biggest hurdle is altitude sickness and that is the X factor on any mountain journey, but Tusker’s founding guide, Eddie Frank, has worked tirelessly to train his guides in wilderness medicine with an emphasis on high altitude problems. This results in Tusker’s success rate that hovers around 98% percent – among the highest of any company on the mountain. So your chances of succeeding are good even though you are not a peak-bagger yet. By picking ten day routes, Tusker clients are given more time to acclimatize to altitude. Many Tusker competitors try to do it in six days, to save costs – that would be unwise. To attempt Kilimanjaro you to need achieve two pre-trip tasks before you set off for Tanzania. You must get in hiking shape and you must develop the summit mindset. These are linked because you can’t get to Kilimanjaro’s frozen summit without having the right mindset and physical fitness to pull it off. Many people only train in gyms but you will need more than that. You will need to develop a mountain body not a gym body. Think “real life workout.” Less big muscles and more cardio flexibility will get you up the mountain so it’s important for you to start hiking in your local mountains six months before the trip. Buy a good fitting pair of midweight hiking boots and break them in walking in your local park. These will be your most important piece of equipment on your Kilimanjaro climb. Join a hiking club and learn from their experienced hikers. Better yet find a mentor among the club members who not only hikes, but is an adventure traveler. Learn from their experiences what it’s like to venture outside the USA and how they adapt to different foods, cultures and weather conditions. This will build your knowledge base but also instill confidence that you can do it too. Once those boots feel natural, it’s time to get them dirty. After you have conquered the highest summit in your local parks it’s time to start getting to the highest point in your state. If you live in California or Colorado you need to go above 14,000 feet and that will certainly make you Kilimanjaro ready. If you live in Florida where the highest point is 345 feet, get in your car and seek higher ground. This is about building confidence, it’s a gradual buildup to your Kilimanjaro effort. Setting goals is part of this journey and after you have bagged the highest peak in your state, start picturing yourself atop Kilimanjaro. The peak bagger mindset is important if you are going to get there. Kilimanjaro is about the destination as well as the journey. You must be doggedly focused on what it takes to make the summit. You need to find your hiking stride, but also realize hiking at altitude requires slowing down especially if your natural gait is to go fast. You must cop the “reverse race” mentality. The last person to the summit wins. As a first time adventure traveler you will meet people from a culture far different from yours and you will quickly learn one of adventure travel’s biggest gifts. To succeed you need to reach out and bond with the locals. Arrogance is not an adventure traveler’s best friend, but could be his or her worst enemy. The one thing you will have in common with the people you meet on your climb is Kilimanjaro. Your guides and cooks have grown up at its base and have a reverence for it. You will be inspired by them and you will learn how their generational story is often tied to the mountain. You will push together to ascend and when you reach the top you will celebrate your amazing triumph together. And carry the feeling for the rest of your life. That is the moment when you know your inner greatness is real. The first time is always the hardest. In school, business and in sports our biggest achievements often came when we beat the odds, conquered our fears and did things we thought we couldn’t. Adventure travel isn’t that much different. You set a goal, you build a routine to get across the physical and mental barriers and you work like a dog to get there.